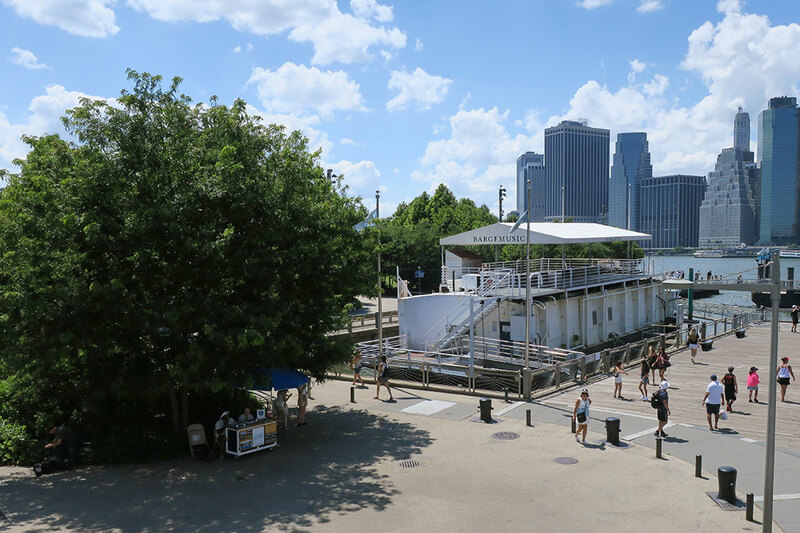 All of the concerts take place inside the Barge, which has heat and air conditioning. There are no restrooms on the Barge. For the locations of public restrooms in Brooklyn Bridge Park, please visit the Brooklyn Bridge Park website. No food or drink is permitted on the Barge, and no photo, video, or audio recording is allowed on the Barge without permission. 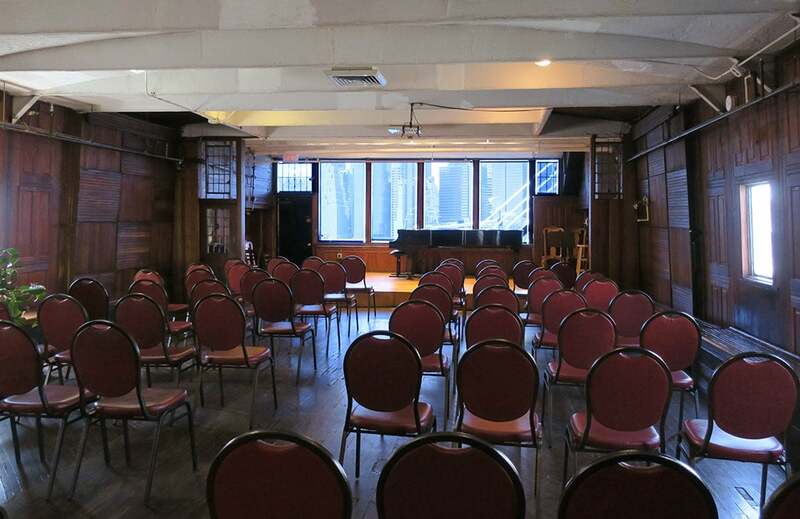 Bargemusic concerts are 1 to 1-1/2 hours, with no intermission. Programs and performers may change on occasion, without notice. Please be aware that although we are permanently moored, the Barge is in navigable waters and sways with the movement of the East River. Bargemusic is wheelchair accessible. As noted, please be aware that the Barge sways with the movement of the river. Take the A or C train to High Street/Brooklyn Bridge. Use the Fulton Street exit. Walk downhill on Cadman Plaza West to the East River, 3 blocks. Take the 2 or 3 train to Clark Street. Walk west on Clark Street to Columbia Heights; turn right; walk downhill to the end of the street. Or take the F train to York Street; go right on Jay to Front Street. On Front Street turn left, and turn right on Old Fulton Street; walk downhill to the river. For information about weekend subway delays, see MTA service advisories. Take the B-25 to Old Fulton Street/Cadman Plaza West. You can transfer to the B-25 from B-41 and many other buses at Borough Hall. You can also transfer to the B-25 (at the Jay Street station from the A or F trains ) at the Fulton and Jay Street corner. 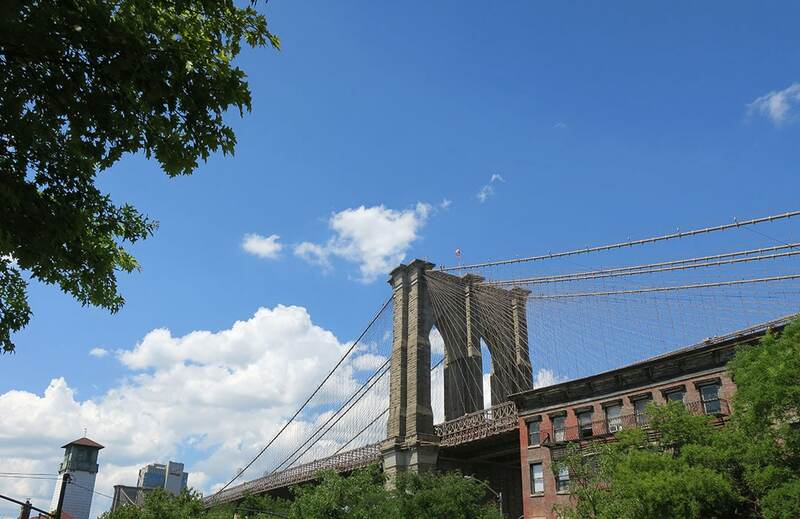 Take the NYC Ferry Northbound or Southbound to Brooklyn Bridge Park / DUMBO. The New York Water Taxi provides service from various locations in Manhattan to Pier 1 / DUMBO. From the FDR Drive—South to Brooklyn Bridge exit. Once on the Bridge, stay in the right lane and take the first exit off the Bridge, which is Cadman Plaza West. After a short distance on the exit ramp, you will reach a fork in the roadway. Take the right fork at the end of the ramp, enter roadway and then bear left. Stay in the right lane of the three lane road and come all the way downhill to Water Street. Make a right turn on Water Street, and the entrance is on your left. From the George Washington Bridge—Take the FDR drive south and see the above directions. From the Lincoln Tunnel—To West Side Highway South. Take the West Side Highway around the tip of Manhattan and back Northbound on the FDR. Drive to the Brooklyn Bridge exit and follow the above directions. From the Holland Tunnel—Take Canal Street exit to Varick Street. Make a right turn on to Varick Street and follow to Chambers Street. Make a left onto Chambers Street and follow signs to the entrance of Brooklyn Bridge. Follow the above directions from the Brooklyn Bridge. From the Brooklyn Queens Expressway/ Long Island Expressway—Take the LIE (495) West to the BQE (278) towards Manhattan and get off at exit 28, Cadman Plaza West. At the end of the exit ramp, make a right and come down two blocks to Water Street. Make a right and the entrance is on your left. From the Manhattan Bridge—Make a right on Tillary Street (second light). Go five blocks to Cadman Plaza West and make a right turn. Follow road as it bears left slightly and go downhill in the right lane to Water Street. Make a right on Water Street and entrance will be on your left. From the Battery Tunnel—Take the first exit, Hamilton Avenue. Make first left, which is the Brooklyn Queens Expressway Eastbound. Take this to the Cadman Plaza exit. At the bottom of the ramp, make a right turn and proceed to the traffic light. Make a legal U turn at the light and stay in the right lane. Follow the road straight down to Water Street. Make a right at Water Street and the entrance will be on your left. From the Verazzano Bridge—Follow the signs for 278-Battery Tunnel (center lane) as you get off the Verazzano Bridge. Follow the signs for the BQE and take the BQE to Cadman Plaza West. Get off at Cadman Plaza West and make a right at the bottom of the ramp. Stay in the left lane and make a legal U turn at the traffic light. Then, stay in the right lane and come all the way down the hill to Water Street. Make a right turn on to Water Street and entrance will be on your left. From Flatbush Avenue—Make a left on Tillary Street and take it to Cadman Plaza West. Make a right turn on Cadman Plaza West and continue all the way as the road bears left. Stay in the right lane and come down hill to Water Street. Make a right turn on Water Street and the entrance will be on the left. From Atlantic Avenue—Follow the road down to the river and make a right turn onto the BQE East to Cadman Plaza West exit. Make a legal U turn at the first light, stay in the right lane, and come downhill to Water Street. Make a right on to Water Street and the entrance will be on the left. For information about parking at 1 Hotel Brooklyn Bridge, which is next door to the Barge, visit the 1 Hotel website. Parking garages: Park Kwik, LLC, 60 Water Street / 37 Front Street, 718.797.2707; and Park Kwik, LLC, 50 Washington Street, 718.222.0500. Limited metered parking on surrounding streets may be available.